Indulge in luxury and laze by the infinity pool, watching the white boats sail within the deep blue of the Mediterranean Sea in total privacy. Explore the authenticity of the perfect holiday destination of Ios, from this traditional style luxury villa; minutes away from Ios island town centre and many popular beaches. The Cycladic Gem Luxury Villa has been uniquely designed to capture the island’s architecture, but also offers all the luxury of modern conveniences needed to pamper its guests. 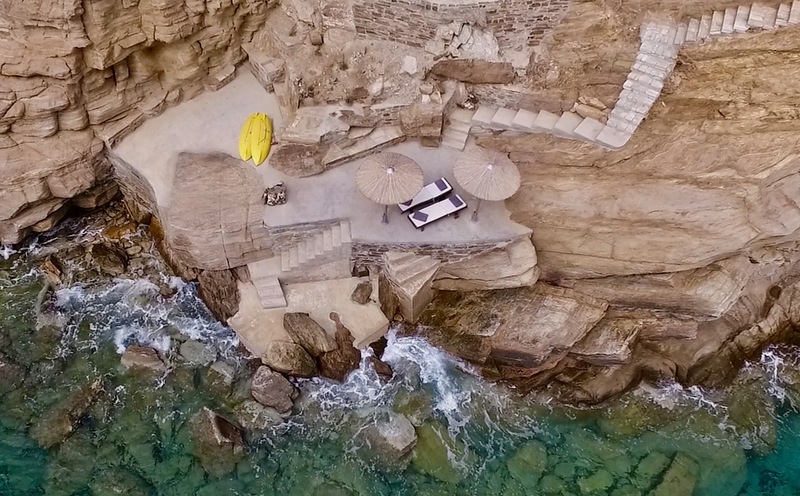 The Villa has been built with mostly hand cut local stone & features a gorgeous infinity pool & overflow spa Jacuzzi, for those romantic moments.The Villa Gem also boasts its own private organised rocky beach access, just a few steps away, where one can relax and enjoy a refreshing dive. The spacious five bedroom Gem can accommodate 10 people with comfort, or even more, making it ideal for family holidays or groups of friends visiting Ios island. You are sure to be totally mesmerized by the captivating view of the Mediterranean sea, Beach & Santorini island. Our Cycladic Luxury villa is the perfect destination to make your dream holiday a reality. Welcome to Ios, the true gem of the Cyclades! 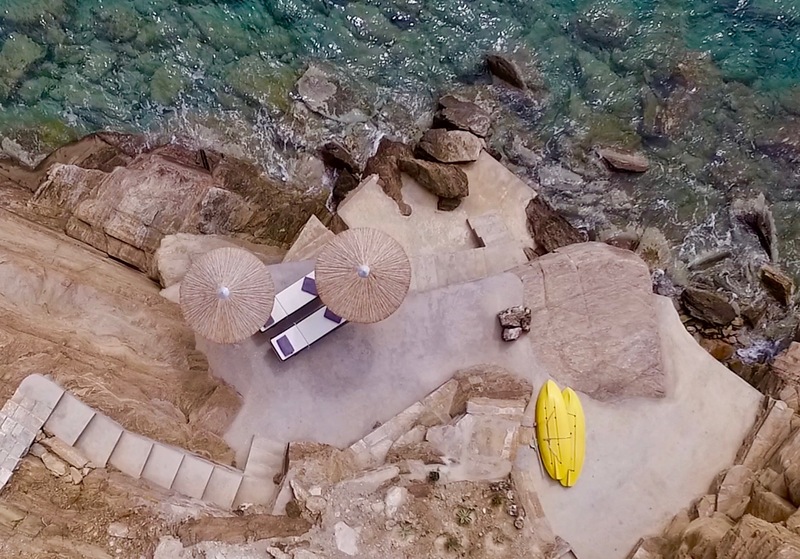 Οne of the great assets of this property is its own private amazing rocky beach access, with organised sitting area, BBQ, umbrellas and sun beds, just a few steps away, where one can relax and enjoy a refreshing dive. Sit back, relax, sip a cocktail, daydream….. as you watch the magnificent yachts & boats sail in & out of the surrounding crystal clear waters. You just may be lucky enough to catch a glimpse of the Dolphins & Turtles too. The Cycladic Gem Luxury Villa boasts a spacious 130 square meter open plan living & lounge area. Furthermore it has five bedrooms, three with king size beds and two with queen, with an extra study room that could fit two more single beds if needed. The villa can readily accommodate 2 big families or up to 10 (even 12) people quite comfortably, while it also offers daily service. Come, relax & enjoy with your family and friends, where you are sure to be totally mesmerized by the captivating view of the Mediterranean sea, Beach & Santorini island. 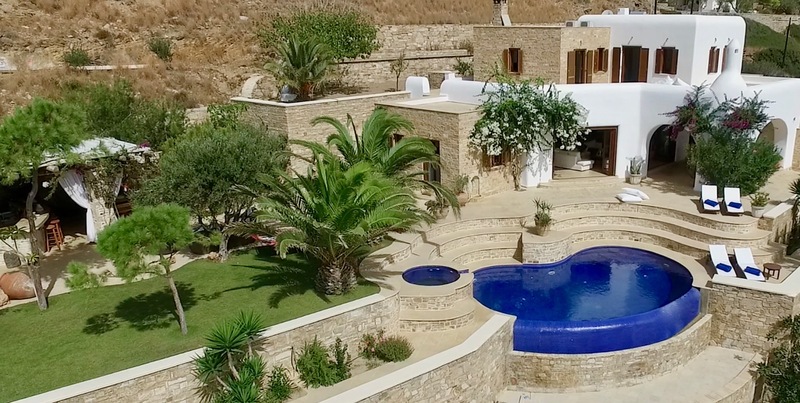 Live with your loved ones an unforgettable vacation experience, in this beautiful and traditional Cycladic Luxury villa, in the incredible island of Ios. The Gem is ideal for family entertaining, an impromptu party or just a quiet afternoon lazing in the hammock, whatever may take your fancy. Villa transfers on arrival & departure available. Daily Villa service. Amenities: Toiletries, robes, slippers provided. Two bedrooms have built in safes for your valuables. We have spare beds available on request. We will happily at your request pre-stock the villa before your arrival. Upon request we can also organize: private cook, child care, private helicopter & boat transfers, restaurant reservations, car, bike & boat rentals. Event organization, like weddings, baptisms, birthdays, occasion cakes, private Island land & sea tours, picnics, personal shopper, massage & beauty treatments, laundry services are also available. The services & facilities above may only be available after prior arrangement, therefore please e-mail us your wishes. Additional fees, terms & conditions apply depending on the service provider. Three bedrooms offer king and two queen size beds. Every bedroom & common area has been designed to benefit from the breath taking sea view of the Villa, with each having its own outdoor access and balcony or patio. There are four bathrooms, three of them fitted with Rain showers & one with Rain shower and a Jacuzzi spa bath. With the under floor cooling & heating, throughout the villa, hot summer days and chilly nights won’t be an issue, but there are separate Air Cons in every bedroom, should you require a different temperature setting. The Gem’s study is designed to accommodate your different needs and can be changed into a dedicated gym room or even turned into a bedroom, upon request. The Villa sleeps 10 people, but can easily accommodate a few more, if required, making use of its study and its commodious open lounge. The living room is connected to a handcrafted, contemporary Oak & Granite main Kitchen, which is fully equipped with two ovens, a microwave, a dishwasher and a Nespresso coffee machine. There are many different in-house or exterior family & dining area options to suit your mood or occasion, with marble floors inside & out. There are two open fireplaces one inside in the main living area & one outside under the main balcony. There is also a second custom built fully equipped outdoor kitchen with panoramic views, right beside the lawn & overlooking the infinity pool & spa. This outdoor kitchen has a traditional handbuilt wood fire oven & traditional Greek BBQ. It is complete with a large granite bar, a dishwasher, but most importantly a seating area covered by a pergola. Free Wi-fi is all throughout the Villa including all the outdoor entertaining areas. There are several flat screen Tv’s with Nova Satellite Tv & music systems for your use, that connect with your Android or iPhone. For the energetic the Gym’s equipment includes a Commercial treadmill, Spin bike & TRX. For extra autonomy there is also a dedicated laundry room. The villa also has it’s own 2 canoes that we keep on the shore should you wish to explore the surrounding beaches by sea! The Cycladic Gem Luxury Villa is open from May until October. Booking Conditions: 30% booking deposit due on reservation. The balance due 8 weeks before arrival. Cancellation policy: In case of cancellation 8 weeks or more before arrival 30% (non-refundable deposit) is forfeited. Less than 8 weeks before arrival any payments made are forfeited. Security deposit: Is not required but any breakage/damages will have to be reimbursed to the owner. Check-in time: 16:00 Check-out time: 11:00 Unless otherwise agreed. SPECIAL OFFERS when available will be advertised here. Please do not hesitate to contact us should you have any further questions, we want to help make your holidays as special as we can. No request is too much for us. We are not happy until we know you have had the perfect holiday.